The Diverse Makerhood Festive Showcase will run from 1 – 31 December 2018. On the launch day of 1 December customers will be offered free drinks and nibbles while they browse. Diverse is at 390 Coldharbour Lane, Brixton, London SW9 8LF. If you can’t get there in person, have a look at their new website! Machine knitter and felt maker Prilly Lewis designs and makes beautiful clothing, home ware and accessories. Using British spun lambswool, all items are originally created from her central London studio. Artist and maker Gabriela Szulman creates pictures, greeting cards, jewellery and decorative objects with images inspired by memory, nostalgia and a love of everything vintage. She also runs regular workshops in her south London studio. Cecilia Washburn is a textile designer and illustrator who studied fashion design, specialising in printed textiles, at Ravensbourne in London. She has since been working in the fashion industry as a textile designer and continues to do so alongside producing original artwork, prints, stationery and cards. Snezana Nikolic of Y Kairos tailors beautiful clothes for children that she sells at craft markets and by working to private commission. The clothes are lined and use high quality fabrics that mean your child will have a look of distinct class. She also makes baby accessories. Annie Crimp is a mosaic artist, making mosaics for the home and garden. She loves to upcycle and uses all manner of materials, from car windscreen glass to broken jewellery – in fact anything she can lay my hands on! She also has a jewellery range which she makes using old damaged vintage china. Miri Shalom came across gorgeous druzy crystals in 2015 and was instantly totally enamoured by their raw beauty and the fact that each crystal was unique in its shape and size. This opened up a whole new world as she started learning about the meanings of all the different types of crystals, and their healing properties.This was the perfect route to take her passion for jewellery making to a deeper and more spiritual level. Collections feature crystals, hand-crochet, tassels and intricate bead work. Amy Rose Tucker of A.R.T Designs has been hand making personalised and bespoke frames for happy customers since 2011. All frames are handmade with love to the highest quality, using sustainable materials. Each one is unique and is as special to her as it is to her customers. “Reuse, remake, relove” is the motto of Kim Winter of Flextiles. Her interest in sustainability led her to start upcycling, creating one-off pieces by buying items from charity shops and overdyeing with indigo using resist dyeing techniques. Each piece is different, so she doesn’t get bored, and her buyers know they are getting something unique. The charities benefit – and so does the environment, as extending the life of a garment by an extra nine months reduces its environmental impact by 20-30%. Catherine Rose’s festive pom poms and ceramic tile coasters are sure to brighten up your home this Christmas. We’re delighted to announce that we’re teaming up with Diverse in Brixton again for a Makerhood Festive Showcase from 1 – 31 December 2018. This is a great opportunity for makers to work with a local retailer and have their work highlighted in an exclusive section of the shop. Items are on a sale or return basis, and Diverse will take 35% commission on anything sold. Participating makers will also be required to pay £10 towards marketing and a launch event. There are only 12 places available this year, due to restricted space. Applicants must be members of Makerhood and must be able to provide good quality photos and descriptions for their products as Diverse will also be selling online. To apply, please email info@diversegifts.co.uk. Closing date for applications 14 October. All candidates will be notified by 31 October. WOW: We’re back for 2018! At Makerhood we love the amazing Women of the World festival – an annual celebration of women and girls at the Southbank Centre with so many wonderful activities, talks and events. If you haven’t been, check it out – it’s absolutely fantastic and there is something for everyone. WOW Market is part of the festival and takes place on 9 – 11 March at Royal Festival Hall. We’ve been privileged to showcase the brilliance, talent and skills of makers in Lambeth and Camberwell since the market’s launch. Six fantastic makers are showing and selling their work this year – see below. Come find us and say hello – entry to the market is free! Cecilia is an illustrator and textile designer creating intricate and vivid illustrations of wildlife. At WOW Cecilia will be offering limited edition prints, greetings cards and notebooks. Corrine is a designer and London beekeeper making contemporary silver jewellery with a hexagon theme. Corrine’s creatives include silver hexagonal rings, pendants, necklaces and earrings with hand textured finish. Sinead is a designer and printmaker producing local London screen prints depicting different parts of London. Sinead will be selling her limited edition prints on Saturday. Kes is a face-painter and mosaic artist living in Lambeth whose mosaics are very colourful and full of texures. Kes will be showing and selling her homewares range including door numbers and wall tiles. Linda’s vibrant works are built up using a technique of carefully layered paint to create a tonal depth whilst alternating between the darkest shadows and the light combining animal studies or portraiture with elements of the surreal. Linda’s limited edition art prints and screen prints will be on offer on Sunday. Machine knitter and felt maker Prilly Lewis designs and makes beautiful clothing, home ware and accessories.Using British spun lambswool, all items are originally created from her central London studio. You can find Prilly’s wonderful throws, cushions and mini lavender pillows on our stall on Sunday. We look forward to seeing you at Women of the World 2018! The Makerhood Festive Showcase at Diverse kicks off, appropriately enough, on Small Business Saturday, 2 December, and runs until 6 January. As usual, there’s a splendid and varied range of local makers taking part, so why not shop local this Christmas, knowing that you are encouraging local creativity and supporting local business? Machine knitter and felt maker Prilly Lewis designs and makes beautiful clothing, home ware and accessories. Using British lambswool, all items are originally created from her central London studio. Whilst maintaining an individualistic quirkiness, she is able to remain true to her own style yet flexible enough to respond to the particular needs of individual commissions or outlet requirements. The Ray was founded by sisters Issy and Abi. They make modern luxe homeware and accessories, printed and sewn by hand in our south London studio. Their practice is constantly evolving, but they love creating research-led print designs that tell a story and that look beautiful. Kim Winter of Flextiles specialises in upcycling. She buys garments and accessories in charity shops and overdyes them with indigo, using a technique called shibori (like sophisticated tie dye). This means that all her products are one-offs. This makes it more interesting for her, customers know they are getting something unique, and the charity shops and environment benefit too – so everyone wins! The hand printed metallic card holders by Anna Jackson of Black Cactus London are made from recycled leather and perfect for carrying your credit cards and travel cards. The texture and colour combination in each piece is a one-off. And it is different colours on each side, as pictured. Each piece comes with a little card of uniqueness and makes a thoughtful gift for those who enjoy ethical fashion. Uche Akiti of Mya and Joe is a small independent handmade jewellery, craft and gift supplier. She is passionate about individuality and joyful expression of self. Her love of experimenting with shapes, colours and textures leads to the creation of her pieces. Shirley Nelson of artigianajewellery makes limited edition handmade pieces, often one off, in sterling silver, gold, acrylic, resin, precious and semi-precious stones. As she works full time, jewellery is her passion project and a form of meditation – a time allowed to focus on something that gives her so much enjoyment and where from the depths of her imagination the idea for a ring, necklace etc can spring. From a very young age, Miri Shalom of Tiana Jewel was mesmerised by craft and design. Today, crystals have become her intimate passion, and Tiana Jewel was named after her beautiful daughter. Miri always seeks out the best sources for her crystal collections, each piece being hand picked for its raw beauty and unique healing properties. Annie Crimp‘s jewellery range is made from old damaged vintage china. She just loves the thought that small broken pieces can be put together again to make a beautiful whole to be treasured anew. Each one of her pieces is original, unique and one of a kind. At age 5, Carol Cole of Darcy & Jazz used to secretly go into her mother’s jewellery box and play dress up. Pearls, gold and silver bangles, dressing rings, gate bracelet, gold creole earrings is where her lingering obsession started. She finds inspiration visits from all around but mostly from her cultural ancestral legacy, and what it means to be Black in this world; nature, music, art, fabrics, and individuals also inspire her. A.R.T Designs by Amy Rose Tucker is an innovative jewellery and giftware brand offering a wide range of irresistible design led and personalised products using vintage, recycled, up-cycled and sustainable materials. All the products are handmade with love, bringing individuality, charm and character into their customers’ worlds. Gabriela Szulman creates prints and collages, jewellery, scarves and greeting cards with images inspired by memory, nostalgia and a love of everything vintage. Her work is often humorous and whimsical – unless her romantic side takes over and then we enter into a fairy-tale territory of old-fashioned script, pages of books and music scores populated by chivalrous gentlemen, glamorous ladies, butterflies and rabbits. Kaylene Alder‘s limited edition screen prints were developed to support the work of Peace Direct, an international charity dedicated to stopping wars, one person at a time. 10% of sales from this work will go directly to Peace Direct in order help them support local organisations in areas where there is conflict, to combat the root causes and offer people another way. All of the plants in the prints have healing properties and the pots have adapted peace symbols on them to subliminally make you think about peace in a sneaky way! Kes Young of Heart in Art is a mosaic and face painting artist. As well as running popular workshops she also makes beautiful handmade mosaic door number plaques, mirrors and homeware that are one of a kind created from the heart. Akeisha Walters is a multimedia artist whose Brixton prints also adorn T-shirts and greetings cards. Cecilia Washburn is a lover of wildlife and all things colourful and unexpected. She spends her time intricately studying wildlife to create colourful, bold yet painterly and intricate illustrations and repeat patterns. Her products are all made on recycled paper and are designed with high attention to detail and so that the illustrations will be treasured, perhaps framed and have longevity to them – her cards are more than just a card. Catherine Rose‘s festive pom poms and ceramic tile coasters are sure to brighten up your home this Christmas. Sue Smith comes from a design background, working in fine art, advertising, films, TV, prop making, shop windows and interior decoration. She takes her own designs digitally printed and turns them into cushions, lampshades, blinds and curtains. Sue also facilitates art workshops for children and adults. Snezana Nikolic of Y Kairos tailors beautiful clothes for children. The clothes are lined and use high quality fabrics that mean your child will have a look of distinct class. She also makes baby accessories. Durability and quality are her priorities because she wants each garment to be passed from generation to generation – to be sustainable. The handmade crocheted hats made by Boyz Can Wear Pink Too challenge the stereotypical view that pink is only a feminine or girly colour, and give a chance to everyone to wear this colour and feel comfortable. By making and selling predominantly pink hats, they want to spread a message that the various shades of pink are great colours, and that colour has no gender! Pink can be stylish, pink can be smart, pink can be funky, for girls AND boys! Diverse is at 390 Coldharbour Lane, Brixton SW9 8LF. The Makerhood showcase at Diverse, the independent gift shop in Brixton, will run again this Christmas, from 2 December to 6 January. Anita Thorpe, who owns Diverse, has always been a great supporter of local makers, giving many of them their first experience of selling through a retailer. So if you have never sold through a retailer, this is a great opportunity to dip your toe in the water. (Previous sellers are welcome back too!) Anita is very patient and gives useful feedback about your work and how the process works. Items are taken on a sale or return basis, with 35% commission. If you are selected to take part you will also need to pay £10 donation towards the cost of marketing and drinks for the preview event. To apply, send email to info@diversegifts.co.uk with sample images or a link to your website/social media. Include retail price details. State MAKERHOOD FESTIVE SHOWCASE in subject box. Closing date for applications: midnight on Tuesday 31 October. We’re very excited to announce the first issue of our digital Makerhood magazine! The focus is on trade shows, the subject of our July Makers’ Club meeting, where maker Rosa Pietsch and Brixton retailer Anita Thorpe of Diverse talked about preparing for a show from the point of view of an exhibitor and a buyer. There are top tips on how to pimp your product shots by Gabriela Szulman and Jonny Dredge, and a Q&A with maker and Makerhood director Kim Winter. The magazine also contains information on two opportunities for Makerhood members – the Festive Showcase at Diverse and free business membership of Zipcar. Click here to see the magazine for yourself. Huge thanks to Jonny Dredge for co-ordinating and designing the magazine, and to all contributors. We’d love to hear what you think – and do let us know if you’ve got any ideas for future issues! Ever thought of doing a trade fair such as Pulse or Top Drawer to start selling in large volumes? Or perhaps you’ve done a couple and are wondering how to improve? Trade fairs can be a great step towards scaling up for makers, designers and artists – but they require significant investment of money and time. Is it worth the risk, and how do you make the most of them? You will have a chance to ask questions and discuss your your specific considerations with other makers who can offer a perspective and advice from their experience. Makerhood is a social enterprise that promotes the work of local makers in Lambeth. Click here to find out more about the Makers’ Club and how to join. Image credits: Headline image by Top Drawer Press team; Image of Anita taken by Mike Urban of Brixton Buzz; Image of Rosa taken at Pulse trade show. Women of the World Market 2017: we’re back! Makerhood will have a stall at the Women of the World Market on Sunday 12 of March, part of the fantastic WOW Festival at the Southbank Centre – this is our 5th time! It’s a vibrant and busy event showcasing women’s achievements, and we’re honoured to be there again. The market is on the ground floor of the Southbank Centre and is free to attend. We will be represented by three wonderful makers from Lambeth. Anna Jackson is a Printmaker and also makes hand printed leather accessories under the name of Black Cactus. Forms and textures from nature are her strongest inspiration. She works with texture, colour and organic shapes and remind us of the pleasures a personal connection to nature. Anna will have a selection of hand printed metallic accessories made from recycled and reclaimed leather as well as non-leather pieces. Corrine Edwards is a London Beekeeper, artist and designer who makes contemporary silver jewellery with a hexagon theme. Corrine will be selling rings, bangles, and pendants. Stud and drop earrings are made individually in pairs with unique textures. Pieces incorporate PMC (precious metal clay) and rolled textured silver. Gabriela is an artist and maker. She creates prints and collages, greeting cards, jewellery and scarves with images inspired by memory, nostalgia and a love of everything vintage. Gabriela will be selling decoupaged objects such as dishes and dolls, brooches and greeting cards. Come and enjoy the festival and the market – and say hello to our makers! Makerhood is all about local. But that doesn’t mean we aren’t interested in things outside Lambeth. In the past five years we’ve come across more and more makers all over the world who are working to strengthen their local community and to bring local makers together. 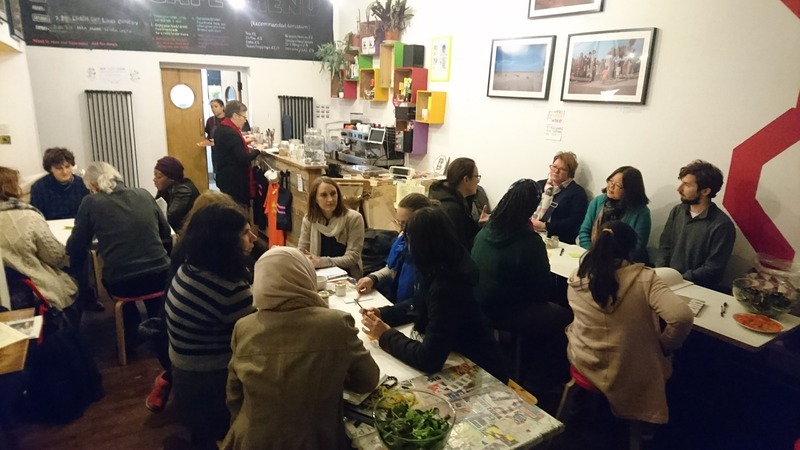 So we were very excited to host our first international speakers at a Makers’ Club meeting on 8 February at the Brixton Pound Cafe. Our special guests at the meeting were Kadek Febryanti (Febry) and Ellya Zukhaylla. Febry manages communications for the Tunjung Womens’ Creative Project in Bali and also works as a freelance buyer of fairly traded crafts for Shared Earth UK while Ellya is a Lecturer in Industrial Design at the Sepuluh Nopember Institure of Technology in Surabaya, East Java, who researches small scale craft production businesses. 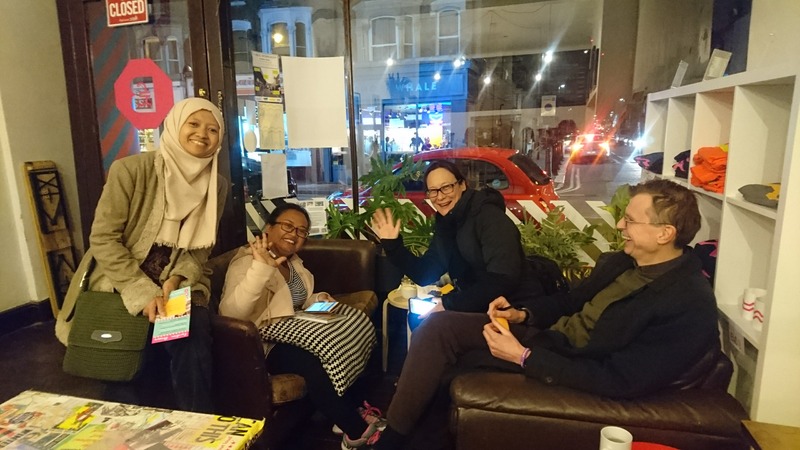 Febry and Ellya are visiting the UK from Indonesia as part of the Create Connect Sustain research project run by the University of Sheffield. They came along to Makers’ Club to meet Lambeth-based makers and to share the challenges of developing businesses as makers. As it turns out, many of the challenges are the same wherever you are based! Using social media – it’s free! It was interesting that these tips applied whether you’re a maker in Indonesia or Lambeth. And it was a great way to meet new friends from both near and far. 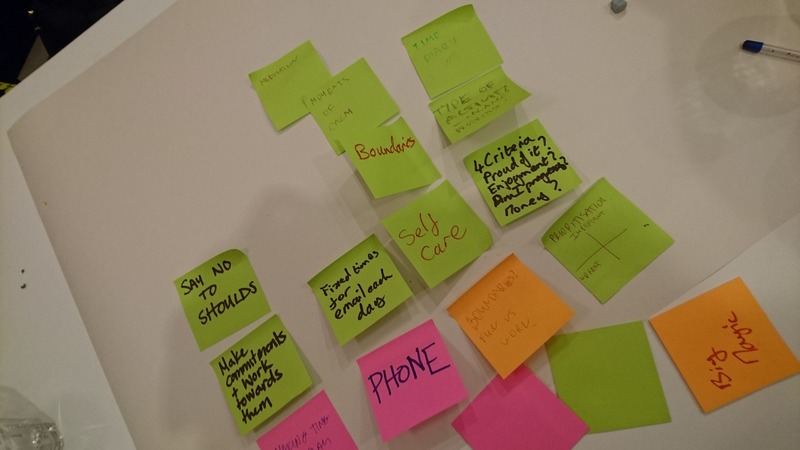 We’d like to say a huge thank you to our special guests, Andy and Ann from the Create Connect Sustain research project and all our fabulous Makerhoodies for generously sharing their experiences. Now, if only we could make a return visit to Indonesia some time….